The French painter Paul Cézanne, who exhibited little in his lifetime and pursued his interests increasingly in artistic isolation, is regarded today as one of the great forerunners of modern painting, both for the way that he evolved of putting down on canvas exactly what his eye saw in nature and for the qualities of pictorial form that he achieved through a unique treatment of space, mass, and color. Cézanne was born at Aix-en-Provence in the south of France on Jan. 19, 1839. He went to school in Aix, forming a close friendship with the novelist Emile Zola. He also studied law there from 1859 to 1861, but at the same time he continued attending drawing classes. Against the implacable resistance of his father, he made up his mind that he wanted to paint and in 1861 joined Zola in Paris. His father's reluctant consent at that time brought him financial support and, later, a large inheritance on which he could live without difficulty. In Paris he met Camille Pissarro and came to know others of the impressionist group, with whom he would exhibit in 1874 and 1877. Cézanne, however, remained an outsider to their circle; from 1864 to 1869 he submitted his work to the official SALON and saw it consistently rejected. His paintings of 1865-70 form what is usually called his early ``romantic'' period. Extremely personal in character, it deals with bizarre subjects of violence and fantasy in harsh, somber colors and extremely heavy paintwork. Thereafter, as Cézanne rejected that kind of approach and worked his way out of the obsessions underlying it, his art is conveniently divided into three phases. In the early 1870s, through a mutually helpful association with Pissarro, with whom he painted outside Paris at Auvers, he assimilated the principles of color and lighting of Impressionism and loosened up his brushwork; yet he retained his own sense of mass and the interaction of planes, as in House of the Hanged Man (1873; Musee d'Orsay, Paris). In the late 1870s Cézanne entered the phase known as ``constructive,'' characterized by the grouping of parallel, hatched brushstrokes in formations that build up a sense of mass in themselves. 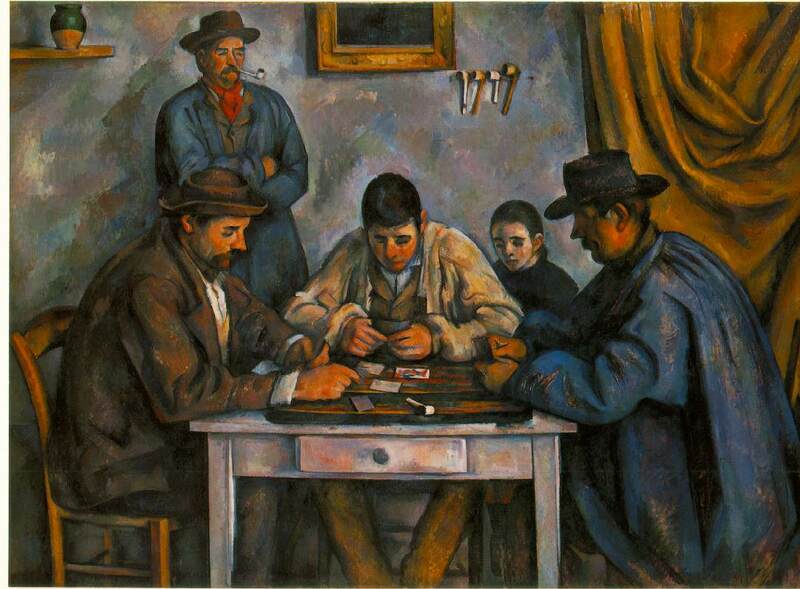 He continued in this style until the early 1890s, when, in his series of paintings titled Card Players (1890-92), the upward curvature of the players' backs creates a sense of architectural solidity and thrust, and the intervals between figures and objects have the appearance of live cells of space and atmosphere. Finally, living as a solitary in Aix rather than alternating between the south and Paris, Cézanne moved into his late phase. Now he concentrated on a few basic subjects: still lifes of studio objects built around such recurring elements as apples, statuary, and tablecloths; studies of bathers, based upon the male model and drawing upon a combination of memory, earlier studies, and sources in the art of the past; and successive views of the Mont Sainte-Victoire, a nearby landmark, painted from his studio looking across the intervening valley. The landscapes of the final years, much affected by Cézanne's contemporaneous practice in watercolor, have a more transparent and unfinished look, while the last figure paintings are at once more somber and spiritual in mood. By the time of his death on Oct. 22, 1906, Cézanne's art had begun to be shown and seen across Europe, and it became a fundamental influence on the Fauves, the cubists, and virtually all advanced art of the early 20th century.